When it comes to poisonous snakes there are a number of these serpents that can be found in the United States. Residents in one of the United States most southern states, Florida, can certainly attest to this fact with more than a handful of the most venomous snakes making their home in the panhandle! In this article we will cover some of Florida’s most venomous snakes including: the southern copperhead, the cottonmouth, the eastern diamondback and the timber rattlesnake. The southern copperhead is one of the most commonly recognized poisonous snakes to be found in the southern United States. This venomous snake is also referred to as the copperhead, highland moccasin or the chunkhead. This snake grows to anywhere from 22 to 36 inches long and has a wide body marked with light cross bands. The cross bands of the southern copperhead take on something of an hourglass shape making them somewhat unique in appearance. The eyes of the southern copperhead are catlike in that they have cat like slits that run vertically. Another distinguishing feature of this snake is the vertical pit that runs between the nostril and the eye. The southern copperhead is found in the panhandle of Florida and prefers to live in damp or wet lowland areas. Bites from southern copperheads are particularly painful but for healthy adults they are generally not deadly if immediate medical treatment is sought. A bite from a southern copperhead can be deadly however, for a young child, elderly person or someone with a compromised immune system. The cottonmouth is another commonly recognized poisonous snake in the southern United States, including Florida. This snake is commonly referred to as the Florida cottonmouth and the water moccasin. There are two varieties of cottonmouth that can be found in Florida, these are most easily distinguished by the geographic area in which they are found. The Florida cottonmouth is found in Florida, South Georgia and southeast Alabama. The Eastern cottonmouth is found only in the extreme western panhandle of Florida, north and east through Alabama to central Georgia and Virginia. The Florida cottonmouth is also distinguishable from the distinct strip on its cheek and two dark vertical marks that can be seen on the tip of the snout. The Eastern cottonmouth does not have such a well defined cheek stripe and does not have any vertical markings on the snout. The Florida cottonmouth measures anywhere from 20 to 48 inches long and are a dark bodied snake with catlike pupils. Florida cottonmouths prefer to live along the wetlands. A bite from a Florida cottonmouth should be treated immediately as it can be particularly dangerous to anyone who is bitten. The Eastern cottonmouth measures anywhere from 20 to 48 inches long much like the Florida cottonmouth and also have a dark and heavy body with catlike pupils. The Eastern cottonmouth also prefers to live along wetlands like Florida cottonmouths and a bite from this snake can be just as dangerous. The Eastern diamondback is also commonly recognized as an Eastern diamondback rattlesnake, a rattlesnake or a rattler. The Eastern diamondback grows to anywhere from 36 to 72 inches long and has a heavy body marked with brown centered diamonds that run down its back. The borders of these characteristic diamonds are cream in color and the basic body color is brown. As with all rattlesnakes, the tail of this snake ends in a rattle unless the specific individual snake was born without a rattle or lost its rattle somehow. The pupil of the Eastern diamondback is vertical and catlike and this snake has a deep pit that runs between the nostril and eye. These poisonous snakes can be found throughout Florida in addition to being found northward in to North Carolina, westward in to Mississippi and eastern Louisiana. These snakes prefer to live in wooded areas but are often found in areas inhabited by humans. This venomous snake will not always rattle before biting and when it does bite the bite can be particularly dangerous if it does not receive immediate medical attention. The timber rattlesnake is also recognized as the canebreak rattlesnake. This poisonous snake grows to anywhere from 36 to 60 inches long and is a heavy bodied snake. The timber rattlesnake is characterized by the presence of a red brown stripe that runs down the center of the snakes back and is crossed by large black cross bands. The base body color of this snake can be described as pinkish grey or tan. The tail of this snake is completely black and tipped with a rattle unless the snake was born without a rattle or lost its rattle at some point. The timber rattlesnake can sometimes have a dark diagonal line that passes through or just behind the eye in addition to a pit between the nostril and eye. This particular breed of rattlesnake is found in only a few select areas of Florida, just nine counties in northern Florida. The southernmost range of this rattlesnake is Volusia County and the western most range is Hamilton and Suwannee counties. This snake can also range as far north as southern Maine and as far west as central Texas and southeastern Minnesota! These snakes prefer to live in low bottomlands that are damp and support small wildlife. As with any poisonous snake, someone who is bitten by the timber rattlesnake should seek immediate medical care to avoid any complications from being bitten. The dusky pigmy is another rattlesnake that can be found in Florida. The dusky pigmy is also recognized as the dusky pigmy rattlesnake, pigmy rattler and the ground rattler. This venomous snake grows to anywhere from 12 to 24 inches long and is a small but thick snake. The head of the dusky pigmy is triangular in shape and the body of the snake is dark grey in color. A stripe of reddish brown color can be seen running down the middle of the back of this snake that is interrupted by dark black blotches with dark spots on either side. The tail of this rattlesnake ends with a significantly smaller rattle than many other rattlesnake species. The stomach of this snake is also colored by black and white splotches that help to distinguish it from many other rattlesnake species. Like many other venomous snakes found in Florida the dusky pigmy rattlesnake features a deep pit between the nostril and the eye. The dusky pigmy rattlesnake prefers to live in lowland flatwoods but can also be found around freshwater sources. This snake is found all throughout Florida with the exception of the Florida Keys and outside of Florida it can be found as far northward as North Carolina and as far westward as eastern Texas and southern Missouri. A bite from a dusky pigmy rattlesnake is not life threatening for the average healthy adult but it can be in some cases. Even if a bite from one of these poisonous snakes does not kill you it is extremely painful and can result in the loss of smaller body parts such as fingers and toes depending upon where one is bitten. It is important as with all poisonous snake bites to seek medical help immediately for a dusky pigmy bite. The Eastern coral snake is also recognized as the coral snake and can grow to anywhere from 20 to 30 inches long. This particular snake is banded with black, yellow and red rings with the yellow rings being much thinner than the other rings. The head of this snake is solid black and the neck features a wide yellow ring before the banding begins. The tail of the Eastern coral snake is black and yellow and does not have any red coloration. The pupil of this poisonous snake is round rather than catlike in appearance. The Eastern coral snake can be found all through Florida including the Florida Keys and it can be found as far northward as North Carolina and as far west as eastern Texas and northeastern Mexico. This colorful snake prefers to live in a wide variety of areas including wetlands and swamps to dry flatlands. There are some who believe that a bite from an Eastern coral snake is always fatal however more recently statistics tend to show that a bite from an Eastern diamondback rattlesnake is much more dangerous. A bite from an Eastern coral snake should always be treated with medical attention immediately. 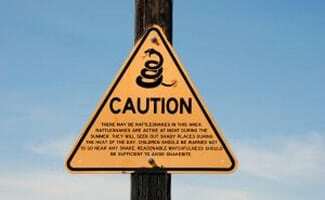 When it comes to poisonous snakes in Florida it is most important to tread with caution. The majority of these venomous snakes will only attack humans when they feel cornered or threatened and so watching where you tread will help to avoid any dangerous snake encounters. If you do happen to run in to any of these snakes, or, in fact any snake at all, it is always best to walk away. If you find a snake in your home and are unsure as to the species it is best to call a professional to help with removal of the snake in order to avoid being bitten. If you are bitten by a snake you should always note the description of the snake if it cannot be caught and visit your local health professional to assess a course of treatment to avoid long term injury or even death. Why Do People Love The Russian Tortoise? Straws make the ocean polluted and many straws in water is waste generated by something most people don’t need. According to National Geographic “An estimated 7.5 percent of plastic in the environment comes from straws.” Straws become microplastics that enter food. If we have strawless spork packets: it will produce less pollution and let the ocean be clean. If we stop using straws, animals won’t die. 1,080,000 straws are thrown away in a year at franklin. 1,100,000 sea animals die annually from plastic. The school should have a straw dispenser for those who need it. Mr. Jacinto could announce that there’s a new dispenser for straws and for those who need it only. According to Nutrition services: there is no health code that says “put a straw in spork packets.” A way of contamination is the salad bar utensils, keypad, baskets, condiment pumps, and the spork pack, not the milk carton. Biodegradable straws are good to have. We would also like to ask you to start recycling plastic because 4% of gas is used as feedstock to create plastic. This shows that if you recycle that plastic won’t end up in animal homes. Quantities of plastic are building up into natural habitats and in landfills. This means animal homes, oceans, and even far away tropical islands are being affected by plastic. Im a herp. who has collected snakes from Arizona to south florida. I have always handled small coral snakes by hand. I only pick up ones that are 10 ” or smaller. Only once have I seen one open its mouth. further more their mouths are so small that it looks like they couldn’t invenomate a flat stretch of my body. Also, If one did connect with my skin, I would be very quick to pull him off. Am I being foolish?